Young farmers proved the future of livestock farming is in safe hands after award-winning performances at The National Federation of Young Farmers’ Clubs’ (NFYFC) Stockjudging competition finals at the English Winter Fair in Staffordshire. 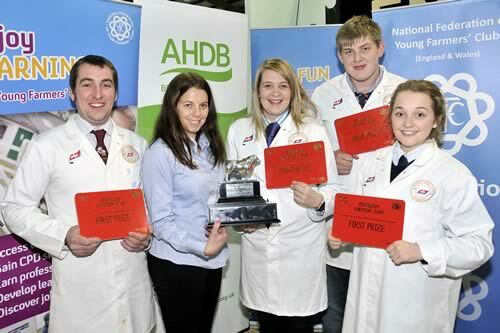 Competitors as young as 13 years old were among the finalists judging pigs and beef, live and carcase in the first competition of NFYFC’s programme for 2016/17. Around 80 members took part in the event, representing nine counties from across the Federation. But it was Herefordshire, Yorkshire and Staffordshire that proved they knew the most about beef and pigs by winning the five team trophies between them. Yorkshire and Herefordshire also excelled in the individual categories too. Sister and brother Fay and Lee Thomas from Eardisley YFC in Herefordshire were part of the team who won the John Spear Trophy for best overall team. "We live on and have been brought up on a family farm in Kinnersley, Herefordshire, with a limousin suckler herd and flock of ewes. Picking the stock is always a family effort, thanks to all the skills we have learnt from YFC stockjudging and transferred into our work. It has been a great honour and privilege for me and my brother to be amongst the winning team and to make our family proud. Huge congratulations to the other half of our team Megan Watkins and John Hanson." Teams in two classes (under 18s and under 26s) were asked to place and classify live beef and place live pigs as well as judge carcases for both animals – and give their reasons to judges over the two-day competition. NFYFC has been hosting its Stockjudging competition at The English Winter Fair since 1997 and was grateful to the exhibitors for providing the stock and to Bagshaw Brothers for the carcases to be judged. Competitors also enjoyed a YFC supper on Saturday evening, which was kindly supported by Bagshaws Agriculture.